SilentPatch is essential to avoid a number of serious glitches which may prevent 100% game completion. Features the ability to import your music for your own custom radio station. Exceeding 30 FPS introduces gameplay and physics-related issues. 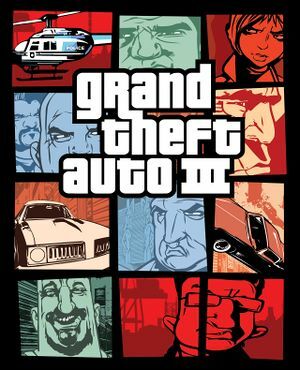 GTAForums - Grand Theft Auto III Discussion. SafeDisc v2 DRM[Note 1]. See SilentPatch to run without CD. Many fixes of this patch has been included in SilentPatch and the v1.1 executable may cause incompatibility with other fixes. Patch 1.1 fixes several bugs. Most digital distribution versions already include this patch. Although this mod was made for Grand Theft Auto: San Andreas, it also works on Grand Theft Auto III as well. Extract the movie folder from the archive, then copy this folder to <path-to-game>, replacing the video files. For the German version, you may need to duplicate GTAtitles.mpg within the mod's folder and rename the copied video as GTAtitlesGER.mpg. Now launch the game. The blank videos should skip the intro and launch straight into the game. A v1.0 executable is recommended. For multi-monitor support, SilentPatch is required. Fixes issues such as broken in-game widescreen presentation and HUD/subtitle scaling in higher resolutions. Adds adjustable FOV and MSAA support for the non-Steam version. Also works as an ASI loader and a D3D8to9 wrapper. Download ThirteenAG's Widescreen Fix here. Extract the GTA3.WidescreenFix folder from the zip archive, then copy the d3d8.dll file and scripts folder into <path-to-game>. (Optional) Download the Widescreen Frontend from the drop down menu where you downloaded ThirteenAG's Widescreen Fix above, then extract the contents of the zip archive and copy them into <path-to-game>, overwriting any files in the process. Fixes numerous bugs and oversights introduced in the PC version, and restores censored content removed from the French and German versions. Copying the AUDIO folder from the "PLAY" disc into <path-to-game> allows the game to be playable without the CD when using SilentPatch. Download the SilentPatchIII.zip and SilentPatchDDraw.zip files here. Extract the contents of SilentPatchIII.zip archive, then copy the models folder and SilentPatchIII.asi into <path-to-game>, overwriting any files in the process. Extract the contents of SilentPatchDDraw.zip archive, then copy ddraw.dll into <path-to-game>. Requires a D3D8to9 wrapper (included in ThirteenAG's Widescreen Fix) and currently only works with a v1.0 executable. Features the ability to restore the visual aesthetics of the RenderWare engine from the console or mobile versions. Download SkyGfx here, then extract the rwd3d9.dll into <path-to-game>, then extract the skygfx.asi and place it <path-to-game>\scripts (create a scripts folder if it does not already exist in <path-to-game>). If you are using Widescreen Fix, you do not need its d3d8.dll wrapper. Go into the III folder extracted from the archive, then extract the neo folder and skygfx.ini into <path-to-game>\scripts folder. Requires a v1.0 executable and an ASI loader (included in ThirteenAG's Widescreen Fix). Also works with Grand Theft Auto: Vice City and San Andreas. Moves the user files folder to <path-to-game>, allowing a downgraded game to be fully portable. Download the mod here, then rename the file extension from portablegta.dll to portablegta.asi. Place the portablegta.asi file into <path-to-game>\scripts. Run the game, exit to desktop, and then delete the contents inside <path-to-game>\userfiles. Copy everything from %USERPROFILE%\Documents\GTA3 User Files into <path-to-game>\userfiles folder. Can be adjusted in ThirteenAG's Widescreen Fix or with Racer_S's FOV Hack. Can be hacked through video card settings. Use ThirteenAG's Widescreen Fix to enable MSAA. Post-process anti-aliasing such as FXAA is also possible. Called Frame Sync. Enabling Frame Limiter caps the game to 30 FPS unless modded. Exceeding 30 FPS can introduce technical issues. 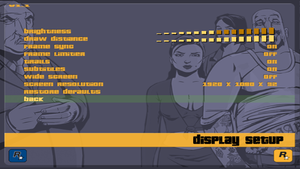 Only 16:9 aspect-ratio is supported as other resolutions are stretched, however, the in-game Widescreen setting causes issues such as stretched HUD, cuts off parts of the image (Vert-), and misaligned aiming. Use ThirteenAG's Widescreen Fix for proper widescreen support. 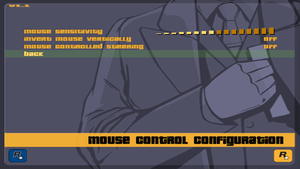 The game has two control styles: Standard accommodates keyboard and mouse controls, while Classic is based on the console control styles. Setting does not save in v1.0. Use GInput and adjust options in GInputIII.ini. Use GInput and adjust InvertLook in GInputIII.ini. Can be enabled via GInput. Requires DS4 Windows and GInput. Set PlayStationButoons to 0 in GInputIII.ini. Connection mode must be configured in DS4 Windows. Game references buttons by number (e.g. JOY1) by default. Use GInput for Xbox and DualShock controller prompts; alternative text prompt add-on is also available. Only for the same type of controller plugged in initially from launch. Adds full XInput and DualShock 3 controller support with relevant controller prompts. Five controller presets, based on console versions and Grand Theft Auto IV. Extract the contents of GInputIII_*.zip, and copy the models folder, GInputIII.asi, and GInputIII.ini files into <path-to-game>. Open GInputIII.ini with a text editor and configure your desired settings. Retail only. Made by publisher. 1) Retail only. Patch for digital release here. 2) Fan voice-over by «GTA: Правильный перевод». Using the in-game widescreen setting causes the player's actual aiming sight to be slightly above and to the right of the displayed crosshairs. 8 For Direct3D 9 support, use ThirteenAG's Widescreen Fix. CLEO - Popular script extender used by lots of sophisticated mods. IMG Factory 1.2 - An alternative .img file manager to the above. GTA III Xbox Version HD - Ports many of the high quality Xbox models, textures, and effects to PC version. 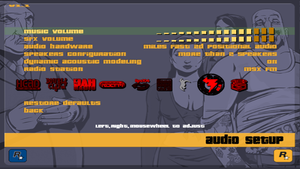 Liberty City - The Leftovers Fix - Restores elements from the original PlayStation 2 version such as the 'Under Surveillance' dialogue and missing song from the Double Clef FM radio station. ParticleEX - Fixes and tweaks particle effects with the ability to use effects from the PlayStation 2, PC, and Xbox versions while retaining their original appearance. Requires an ASI loader. ↑ 2.0 2.1 File/folder structure within this directory reflects the path(s) listed for Windows and/or Steam game data (use Wine regedit to access Windows registry paths). Games with Steam Cloud support may store data in ~/.steam/steam/userdata/<user-id>/12100/ in addition to or instead of this directory. The app ID (12100) may differ in some cases. Treat backslashes as forward slashes. See the glossary page for details. Installing these fixes on a clean install of the game fixed the game refusing the start. This page was last edited on 24 April 2019, at 11:29.